I would like to have started this morning by saying, “I want to take this opportunity to welcome you to Ivy Hill,” but we really do need this rain. More importantly, even though we are disappointed, it is, after all, the service not the setting that matters. In the past we have chosen not to play a role in this service. Generally, our purpose is solely to support the Alexandria Fire Department , by facilitating this annual service. On Monday I saw the program notes, that’s the fine detail of the program. This tells you who is doing what and when; I finally realized I was probably going to have to speak. Up until this morning I was still trying to figure out how not to have a role in today’s service. I came up with all kinds of good ideas that kept me and Ivy Hill in the background where we really want to be. But this last weekend’s activities have given me cause to make an exception this year. I was part of something that made me very proud of being from Alexandria. I don’t know how many of you have any idea of what the Men and Women of the department did last weekend. Firefighters, the EMS folks, people from communications, fire prevention, fire marshals, code enforcement, fire and EMS volunteers along with various and assorted family members willingly pressed into service; I don’t know if I have named them all but you should know what these people did. They aren’t going to say much about this, they will just give their pat answer that they were just doing their job. The reason that I have taken this opportunity to speak is because I mean to tell you what they did. I, along with other members of the staff at Ivy Hill, had the unique privilege to help these dedicated people with the added responsibilities they so willingly assumed. I am sure some of you know that on Sunday last , the National Fallen Firefighters Memorial Service was held here in Washington. It was here because of the numbers. In a normal year, we as a nation, lose around sixty or seventy firefighters. 9 -11 made last year far from normal. We, having our very own piece of this tragedy, luckily lost no firefighters . But because of 9 - 11 somewhere close to 450 men and women were lost across the country in 2001. Because of this usually high number there were a lot of people that came to town for this service. There needed to be organized assistance for these folks. I do not know the total number of people that comprised the family units who were aided in this project, but about 100 of the families arrived here through National Airport. Every family was met by a uniformed firefighter at the gate upon arrival. Most of those were escorted to a hospitality room in the old terminal. Their bags were picked up and transported to the hospitality area. Upon arrival the numbers in each party and where they were going to stay were verified. Once all this was accomplished they were transported to that location. The hospitality room had food and drink, toys for the kids, a package for every family with information and materials; and the smiling faces of friendly caring brothers and sisters of the emergency and fire services to welcome them to our community. Similar things were going on at Dullas and BWI involving the local fire departments; and while I don’t know exactly what they did or how they did it, I am sure it was similar and done very well. What I do know is that the hospitality and transportation operations at National Airport were run by the men and women of the Alexandria Fire Department. And I am here to tell you that this was one of those things that you had to be part of to really understand the true magnitude. Our city was so well represented to so many. The logistics of this were simply incredible. Parenthetically, we (the city of Alexandria) through the efforts of the men and women of the fire department, arranged for the contributions of most all of the goods and services that were needed for them to be unbelievable ambassadors for our city. All of the people comprising those familys that we served will long remember the city of Alexandria Fire Department. This operation officially ran for 4 days - providing the same services for the families arrival as well as their return home. All of the people providing these services gave their time for this to happen. They were off duty or took leave. I was there Friday mid day and again Sunday night. There were so many of our fire department people there and some of them were there, I suspect, the whole time. I know that the fire department is known for taking care of their own. And this is what they were doing but, oh, it was moving and as I said, made me so proud. I wish you could have felt what I did. There are no words that can convey what this was like. We owe a debt of gratitude to these people for representing themselves as well as all of us to such an outstanding degree. I hope that somehow the people of Alexandria will hear about this. Incredibly, these selfless men and women of the department were thanking us for coming to help them. My response to their thanks can, I hope, convey some understanding of how impressive this effort was. I tried to tell these professionals that WE were in fact privileged to have been allowed to participate with them in what was truly one incredibly compassionate act of goodwill. I felt that this story should be told. A great many things done by the fire department go unnoticed. This should not be one of them. We have almost completed this years service. The memorial recognitions are complete, We have honored those that have gone on before. The Alexandria fire department has made presentations to the other departments that responded to the Pentagon on 9 - 11. And while it is more blessed to give than to receive, I think it only fitting that Alexandria have one of the firefighter replicas that they have given to the other departments. I held on to one of these for that exact purpose. I would like Chief Thomas Hawkins, representing the Alexandria fire department to rise and accept the firefighter statue replica on behalf of each and everyone of our firefighters. I was born here in Alexandria, I am a life long resident. Fire prevention is an important element in keeping the residents and those that work, visit and pass through our city safe from injury, and maybe an untimely death. Along with you, Ivy Hill recognizes the importance of preventing fire and injury but in the reality brought home to each of us by this service, Fire Prevention truly keeps these men and women out of harms way. Just because they will, “put it all on the line” for each and everyone of us without thinking about it, does not mean we should do anything less than to try and keep them from having to do so. 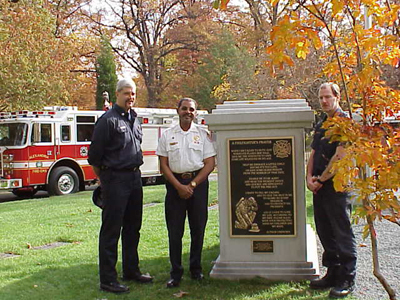 146 years ago the central monument in the circle of honor at the entrance to Ivy Hill was dedicated to honor fallen firemen. In 1970 this circle of honor was opened for use. Mike Conner, who today is acting as the master of ceremony, was a rooky fireman and was one of the two firemen that filled friendship fountain at the dedication 32 years ago. Today we recognize this as a long standing tradition, but it took that 146 years to evolve into what it has become today. Part of this evolution had this same Mike Conner coming out to the cemetery one day some years ago to talk to us about helping formalize the annual wreath laying. You are here today, in part, because of this foresightedness. Over the years we have made it possible for other features to be added to the circle. I want to thank Matthews Bronze, they have been instrumental in our efforts to recognize the contributions of the Alexandria Fire Department. They have had a big part in what has been added over the years and today they provided the firefighter replicas that were presented. Last year, we made some big changes to the fountain and announced our plan to place the columbaria in the circle behind the monument. The Columbaria placed in the circle was a general enhancement to the cemetery. It was not something intended specifically for the fire department, it is available to all. It was however, designed carefully, to enhance the appearance of the circle of honor and the entrance into the cemetery. This spring I was at a meeting and saw a very striking bronze memorial by our friends at Matthews. The very moment that I saw this casting I knew it had to be placed at Ivy Hill in the circle. I realized with the location of our new columbaria we had, quite by accident, created the perfect place to mount this feature. 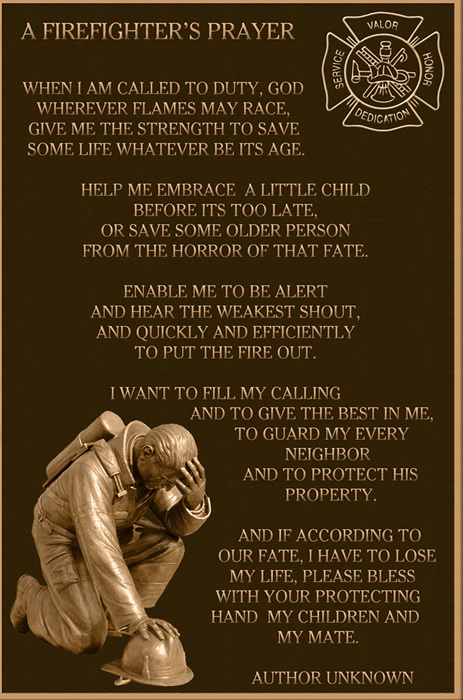 So today, we dedicate this Firefighter’s Prayer to “the men and women of the Alexandria Fire Department, October 11, 2002.” This bronze casting of the prayer and a dedication plaque will be mounted on, the end of the new columbaria, the one on the left, “the perfect place” in the Circle of Honor. 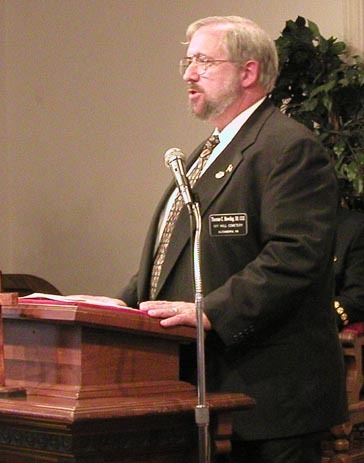 I referred earlier to Mike Conner’s past involvement with this service. Given his historical involvement, I think it very fitting to ask Mike to read the prayer for us at this time. Now our goal, to help mark Fire Prevention week and to promote fire prevention, a concept from Mike Conner,that today is actively promoted and supported by Chief Thomas Hawkins, produced and directed by Richard Sisler, I think for the most part, has been accomplished. Thank you for being here and for being a part of this tradition. 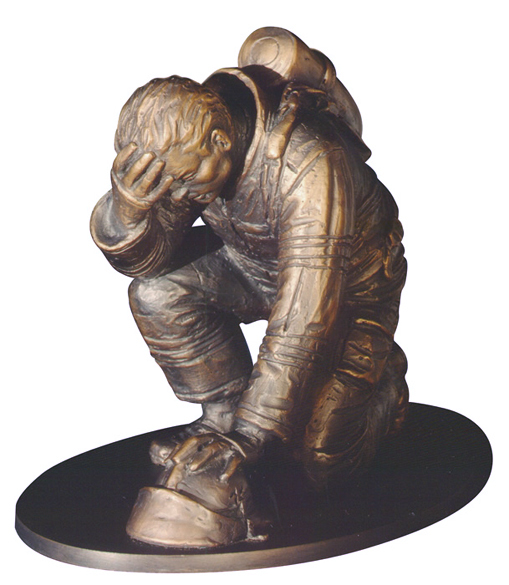 Matthews' bronze honors those fallen in N.Y.
... Last October, the Firefighters Association of Missouri commissioned North Side-based plaque and monument maker Matthews International Corp. to create a bronze statue of a kneeling firefighter. The association wanted to dedicate the sculpture in October 2001, and Matthews turned to its facility in Parma, Italy, to sculpt and cast the 6-foot-by-6-foot figure. Completed in August, Matthews was concerned that ocean shipping could take 45 days and might miss the deadline, and decided to air ship. It arrived at JFK International Airport on Sept. 9, and was awaiting transit to its destination of Kingdom, Mo., when the terrorist attacks occurred. "Our customers started calling us to find out if we had plaques, anything commemorative," said Corinne Laboon, Matthews' public relations director. "We sat down to discuss ideas and someone brought up the firefighter statue. 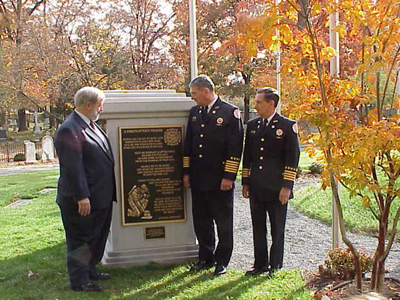 We called the Firefighters Association and without hesitation they decided to dedicate the statue, with Matthews, to the citizens of New York." Getting the statue out of customs and making contact with New York Mayor Rudolph Giuliani took another Pittsburgh touch. David DeCarlo, president of Matthews' bronze division, enlisted help from philanthropist Elsie Hillman who acted as a liaison with Mr. Giuliani's office. In the meantime, Matthews' Pittsburgh staff created a plaque commemorating the firefighters, police and emergency service workers in the line of duty and also drafted one of Matthews' "America the Beautiful" plaques. Both measure four feet by eight feet. On Sept. 17, a customer, Jimmy Donatelli, former owner of Quinet Monument Co., brought a flatbed truck to Matthews' plant and drove the plaques to New York. Statue and plaques are temporarily displayed in front of the Milford Plaza Hotel in Midtown Manhattan. A permanent home has yet to be determined. New Yorkers drape flowers, notes and other remembrances at the statue's base, said Ms. Laboon. The Firefighters Association postponed its dedication, but Matthews Parma plant is working on another statue.